Set in a near-future England where the poorest people in the land are forced to sell their children to a travelling circus - to perform at the mercy of hungry lions, sabotaged high wires and a demonic ringmaster. The ruling class visit the circus as an escape from their structured, high-achieving lives - pure entertainment with a bloodthirsty edge. Ben, the teenage son of a draconian government minister, visits the circus for the first time and falls instantly in love with Hoshiko, a young performer. They come from harshly different worlds - but must join together to escape the circus and put an end to its brutal sport. 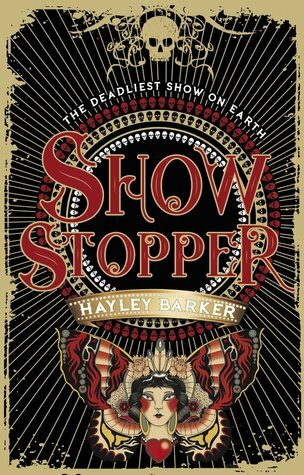 Show Stopper is told from the POV of both Ben and Hoshiko, two very different characters in a dystopian world where people are split into Pures and Dregs. The Pures consist of those who are considered 'Pure English' whilst the Dregs are immigrants. Ben is a Pure, privileged from birth and living better off than most due to his mother's high position in the government. Hoshi is a Dreg who was taken away from her family in the slums and made to perform in the circus, a deadly show that doesn't shy away from killing Dregs for the entertainment of the Pures. This book is very dark, and very terrifying. The attitude that the Pures have with regrads to anyone who is different to them is honestly horrific to read, and the worst part is that there are genuinely people out there in our world today who would share some of those opinions. This story's commentary on racial diversion is so important because whilst it may seem out there and exaggerated, there is a dark reality behind it. The way that this split is explained makes a situation like this feel so believable, and it makes you shudder just thinking about it. Whilst I expected this story to be creepy, I wasn't prepared for just how grim it got. The way the Dregs are treated, even by the circus ringmaster who is also a Dreg, is stomach-turning. It's such a horrible world to read about, and yet I couldn't stop reading. I was completely sucked into Hoshi's struggle, and Ben's realisation that his life as a Pure is nothing like he thought. Ben's side of the story was interesting because the world and the lifestyle he knew was crumbling down around him. Seeing him come to his senses and finally open his eyes to the horror that was going on around him was one of the few points of triumph in this story. 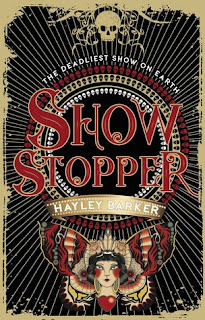 Whilst I enjoyed his narration, it was Hoshi's side of the story that made Show Stopper such a compelling read for me. She had a huge amount of determination and strength that made it impossible not to root for her. The relationship she had with Greta and Amina, others in the circus, was touching and provided some of the more lighthearted scenes in the story. There was romance between Ben and Hoshi, which I expected, but it develops very quickly over the course of a few days. Instalove is something that I really don't enjoy in YA, but when it comes to this story, I understood the need for things to move as fast as they did because no one has the benefit of taking their time with anything. I have to mention that this book is very dark to the point that it felt emotionally draining at times because of how many negative events occur. But it was necessary for the plot and to show us all what the world within this book is truly like. It's definitely not for the lighthearted! I'm interested to learn more about this world, and the steps the society within it took to get to the point they're at now. There's so much more to learn and I'm excited to find out what happens next.